Over the past few years, Vietnam’s tourism industry has gained a global reputation as one of the hottest tourist destinations in Asia. In 2017, despite negative feedback about the tourist experience, the country experienced something monumental. It was a record-breaking year that brought roughly 13 million tourists into Vietnam. The moment you exit Ho Chi Minh City’s Tan Son Nhat Airport the incessant, energetic pulse of the city is inescapable. As Vietnam’s staggering economic development continues, many perceive tourism as one catalyst for further economic growth. “My mission is to set a trend centered around honesty and quality exploration. I prefer to take travelers away from the tourist traps, and into the real Vietnam,” CEO Giang Vu says about his goals with Maika Tours. There are business owners. Then you have thought leaders, or people that set trends by doing things their way. 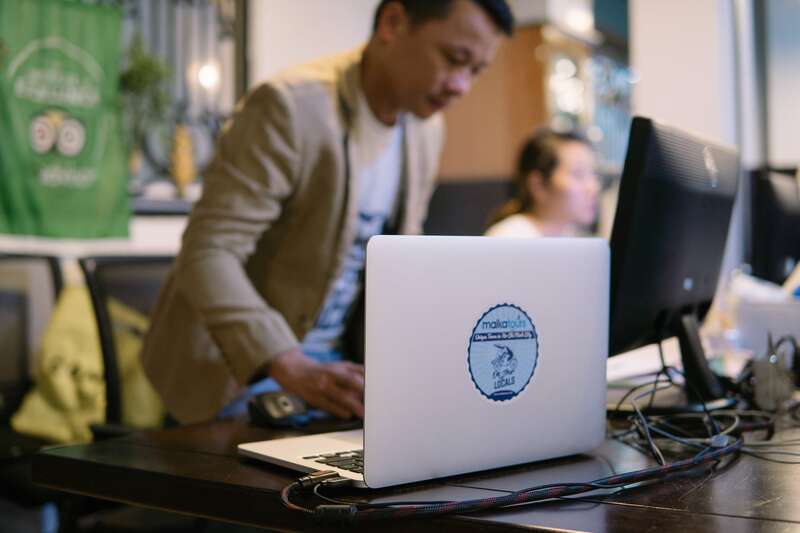 In the tourism industry, we were directed towards Giang Vu, CEO of Maika Tours. He’s a well-respected entrepreneur guiding his guests towards the kind of no-nonsense encounters most travelers don’t experience. While many tour guide companies focus on making a quick buck and neglect customer service, Giang does the opposite. 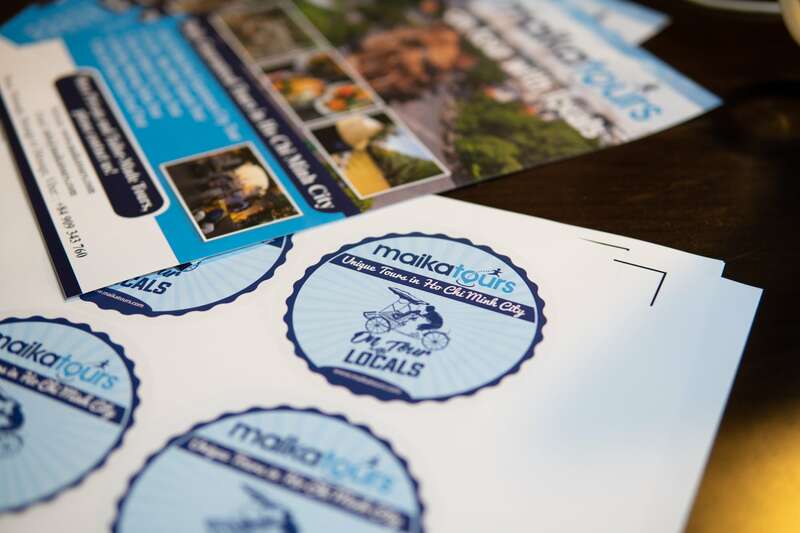 Maika Tours is built around honesty, integriety, and high-end customer service. His relentless desire to provide an unadulterated taste of the real Vietnam is key to changing tourism in Vietnam. So we grabbed our laptops and camera and went to meet Giang. Our goal was simple. We wanted to understand how he’s changing negative perceptions about tourism in Vietnam. “I really believe in karma. If you treat your cusomters right, I believe you will be rewarded with a fruitful business,” Giang gently smiles. Introduce Maika Tours to our readers. I’ve been an internationally inbound licensed tour guide for most of my adult life. I’ve worked in Vietnam for eight years as a tour guide for operators based out of Australia and New Zealand. Following their structure taught me how a professional tour should be organized, and the importance of honest interaction with your guests. There aren’t many opportunities outside of being a tour guide that allow you to establish deep connections with complete strangers. It was these kinds of meaningful interactions that inspired me to start Maika Tours. I also realized there was a noticeable gap in the market for private tour companies. When we opened there weren’t many as I remember. 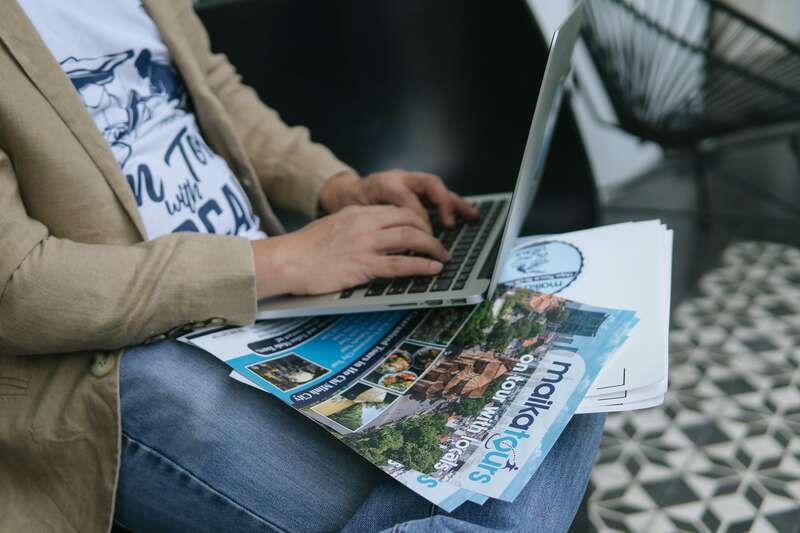 How does Maika tours compare to other tour companies? At Maika Tours we keep the groups small and private. This is one way to guarantee the experience will be authentic. We hang out together and get a lot of facetime. You’d be surprised how the social dynamic changes when tours are organized in a more personable way. This makes guests feel welcome, and provides an unparalleled cultural exchange. “We look at the places our guests want to go and create a made-to-order tour based on their preferences. This is a new trend that we are involved with,” explains Giang. Take us through the different tour packages that you offer. We offer a range of private tours. One of the most unique services we offer is customized tours. We will look at the destinations they want to go and create a private tour tailor-made to their liking. Maika Tours offer shore excursions in Ho Chi Minh City and Vung Tau, Nha Trang, Danang, Hoi An, Hue, Halong Bay, and Hanoi. The time and duration of these tours vary depending on each individual. We guide you through off-the-beaten-path destinations to explore offshore sites you’d normally never know about. For shore excursions departing from Ho Chi Minh City we can pick you up at the following ports: Nha Rong, Hiep Phuoc, Tan Cang, and Phu My. Tell us more about your full-day tours. We have a range of full-day tours. Many opt for the Ho Chi Minh City Tour and the most best time for this tour is from 8AM – 5PM. Besides a few must-see spots like the War Remnants Museum, Independence Palace, the architectural wonders of the post office, and the Notre-Dame Cathedral, we offer an special 45-minutes cyclo ride. This takes you to 10 markets in Ho Chi Minh City’s Chinatown ward and Ho Chi Minh City’s biggest flower market—Hồ Thị Kỷ. This location is outside the center in District 10. It’s a place most travelers would miss out on. During this tour, we also like to share the story of the last helicopter that left Saigon in 1975, the last day of the Vietnam War. Maika’s Cyclco Tour includes visits to the Reunification Palace, the historical Post Office, Thich Quang Duc Memorial, Saigon Opera House, Notre Dame Cathedral, and the War Remnants Museum. The Mekong Delta Tour provides a glimpse into local life on the river. Our suggested time frame is 7:30AM – 5PM. If you are keen on a serious sensory overload, this is the tour for you. It includes a cruise along the Mekong River, a visit to a genuine handicraft village, a journey through the Cai Be Floating Market, and a lunch featuring Vietnamese cuisine. Aside from the usual spots, Maika Tours always aims to take you places not normally offered. We organize unique guide bicycle tour to the secluded Tan Phong island—a spot rarely seen by most tourists. A key compenent to our responsible travel philosophy also includes fair treatment of animals. Horses and mules are often used to cart guests around in this area. Rather than using animals we opt for transportation by bicycle. The Long Tan Battlefield and Vung Tau Highlights Tour is an emotional immersion into Vietnam’s history. We will take you to prominent sites where the Australian Royal Army and the Viet Cong went to battle during the Vietnam War. Curating original photos collected from veterans involved in this area is another unqiue part of this tour. I recommend starting this tour at 8AM and finishing at 5PM. Highlights include Long Tan Cross, Long Phuoc Tunnels, Luscombe Airfield, Nui Dat, Horseshoe Hill, as well as the coast of Vung Tau. We take you to the White Palace, the Christ the King Statue, and up to the lighthouse for a stunning view. Lunch is included. What kinds of half-day tours do you offer? The Cu Chi – Ben Dinh Tunnel Tour is a very popular half-day tour. Like the Cyclo tour, we advise beginning your tour early. This is to avoid peak temperatures and large crowds. We prefer to begin at 7:30AM and wrap up around 1PM for a better experience. Guests can enter the underground labyrinth of tunnels and bunkers built during the war. We also visit a rubber tree facility and the home of a local family. They teach guests how to make rice paper, feed livestock, and allow guests observe a B52 crater on their property. “Guests can explore and even enter the underground labyrinth of tunnels and bunkers built during the war,” Giang elaborates about the Cu Chi Tunnel half-day tour. 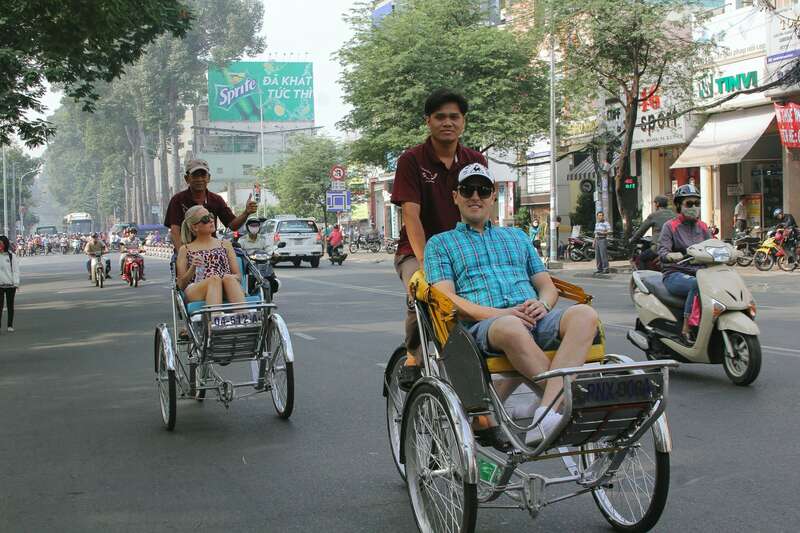 The Ho Chi Minh City Cyclo Tour is a unique way to absorb some of the city’s most prominent sites. To avoid the hottest time of the day we suggest scheduling tours from 8AM – 1:30PM. Cyclo tours slow things down and give travelers the chance to capture memorable photos as they move at a slower pace. We also show you the Reunification Palace, Thich Quang Duc Memorial, Opera House, Notre Dame Cathedral, the former American CIA Headquarters, and War Remnants Museum. The Ho Chi Minh City Street Food Tour is a must if you want to experience Vietnam’s incredibly diverse culinary landscape. As many of the city’s most popular street food areas come to life in the evening we operate our tours from 5:00PM – 9:00PM to make sure you get an authentic take on the city’s explosive food scene. Our certified guides will take you to hidden foodie areas less visited by foreigners, yet highly popular with locals. FOr vegetarians, know there are limited options. Do you offer multi-day tours? Maika’s multi-day tours are 100% customizable and include travel options to all regions of Vietnam. The most popular regions are the south, central highlands, and north. Depending on your schedule, tours can run between 3 and 30 days. It all depends on what our customers want. There is no shortage of breathtaking sites. Phong Nha is one of the world’s largest caves systems. And the UNESCO World Heritage Site of Halong Bay are perfect examples of Vietnam’s diverse scenery. There’s even urban exploration tours in Hanoi and Ho Chi Minh City, floating villages, and the mountain tribes of the central and northern regions. To customize your own multi day tour of Vietnam click here. What makes Maika Tours stand out from the hoards of other tour operators in Vietnam? Maika Tours is built around providing honest tours with a sharp focus on integrity. Anything high-quality goes at a premium, and we market to customers that are willing to invest in a real experience. We aren’t targeting backpackers or low-budget travelers. My mission for Maika Tours is to set a new trend that other operators will follow. It’s about quality not quantity. I compare it to paying for an internationally-ranked 5-star hotel. High-end hotels go to great lengths to be certain you enjoy your stay. I hope that other tour operators in Vietnam observe our attention to customer service and reevaluate their business strategy. If anyone on our tours expresses disappointment, I will give them a refund, but honestly that rarely happens. If our guests are not satisfied, we aren’t either. Positive and negative feedback is an effective way to gauge success and continue to improve. “Quality extends well beyond customer satisfaction. Honesty and integrity are key,” Giang explains. How do you select your tour guides? 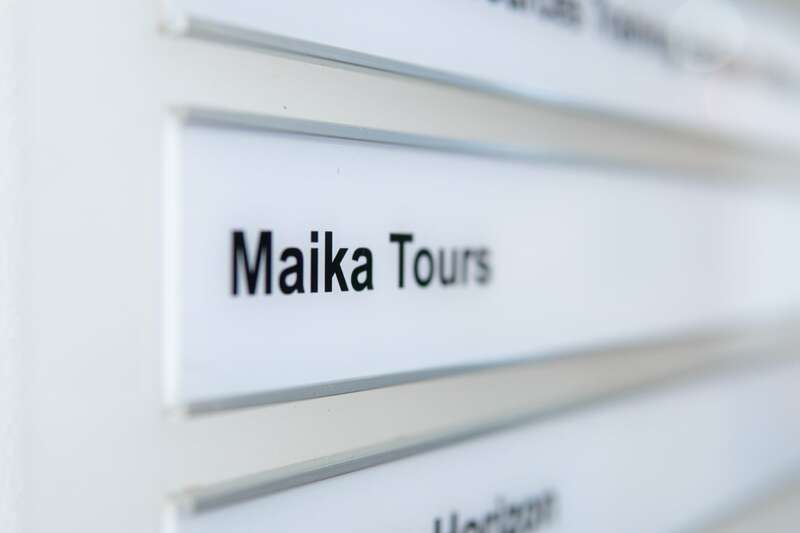 All employees working at Maika Tours must hold an International Tour Guide License. There is no exception to that rule. I find and select the best tour guides primarily through my business network. Our guides undergo training courses with a focus on customer service. We equip them with the ability to provide a “wow factor” for every tour. What elements make for a “5-star” tour in Vietnam? Quality extends well beyond customer satisfaction. It is built from the ground up and must be maintained throughout all facets of the company. We pay our guides double the average rate as motivation to maintain the highest international standards. For customers at Maika Tours we will pay for services like private vehicles. Our standard tours are all 100% inclusive and there are no hidden fees. You don’t have to worry about anything. Visit Maikatours.com to speak with a representative about customizing your own private tour for an honest, authentic experience in Vietnam. Avoiding tourist traps is also key. The prices at these places are not fair for our customers and the items are not authentic. Taking the roads less traveled are the only way to provide an experience that’s real, genuine, and ethical. Is too much future growth in the tourism sector a bad thing for Vietnamese culture? Where do you see Vietnam’s tourist industry in ten years? If tourism grows too fast, Vietnam could become overran by travelers like Thailand. An oversaturated market does not worry me. Give the industry ten more years and I think we will see very promising results. Giang takes a break from our interview at Artfolio Coworking Space for a quick game of foosball in between questions. The trajectory of the tourism industry will have a positive impact on the economy. It should improve Vietnam’s international reputation. The tourism sector can provide more jobs and a better standard of living for many local residents. It has potential to give our people the chance to become respected global citizens. One of my tour guides named Mr. Hai. He is a 70-year-old war veteran who was a translator. Today he is one of our most interesting tour guides. 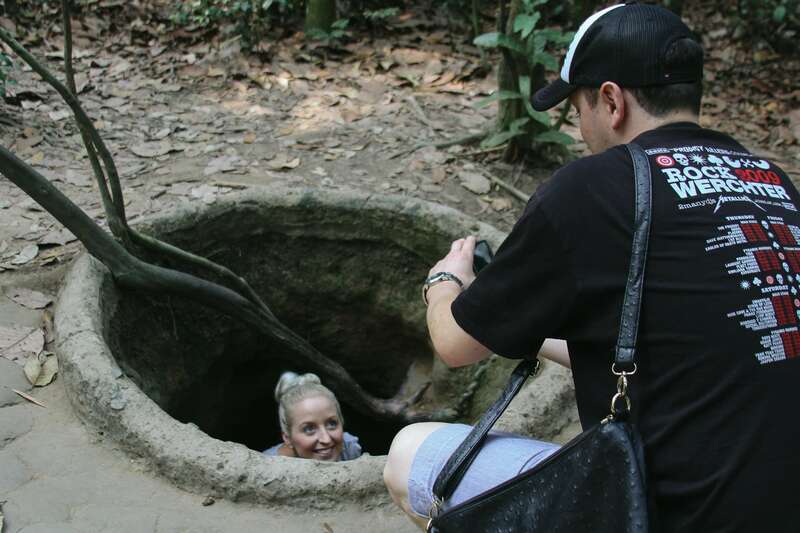 Mr. Hai takes guests to the Cu Chi tunnels and has many interesting stories to tell.